Wing it with these five beauty essentials hand-picked by leading makeup artist, Napoleon Perdis. When a butterfly emerges from a chrysalis, she dazzles with her brightly-colored wings and graceful new guise. The same concept of metamorphosis lies at the heart of Napoleon Perdis. The Los Angeles-based makeup line stands for vibrant color, bold experimentation and unadulterated glamour. Fun, flirty and ultra-feminine, the Napoleon Perdis prestige makeup collection updates classic Hollywood looks with modern-day wit and whimsy, celebrating and elevating each womans god-given beauty. 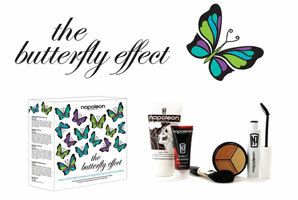 For confirmation, look no further than The Butterfly Effect (RRP:$99, and valued at $196), a deluxe new starter kit filled with all the glamour-girl essentials. Hand-picked by makeup authority Napoleon Perdis, the five iconic products enclosed within the charming butterflydecorated box will spark a spectacular transformation in you. This spring, The Butterfly Effect is all youll need to achieve a flawless new face. The building block of every look: makeup glides on easier and lasts much longer. Auto Pilot Pre-Foundation Primer is infused with chamomile, yarrow extract and vitamin E for complexion perfection and instant hydration for all skin types. Camouflage blemishes like a pro with three different concealer shades. Banish unwanted imperfections with this pot of customizable coverage. Blend like an expert and with ease using our professional-quality brush. Created with function in mind, and of the finest quality hair, this handcrafted brush delivers exquisite results. A modern blush formula so gorgeously sheer, its almost undetectable. Youll look naturally rosy with just a dab on the apples of your cheek. Also doubles as a superb lip stain. Create dramatically inky eyes with our best-selling lash enhancer. The innovative formula features conditioning allantoin, candellia wax and beeswax, plus a double shot of black pigment. Fluttery, as we say, will get you everywhere! Napoleon Perdis picked up his first makeup brush at the age of 13 to help his glamorous motherprimp for a soiree. Since then the self-taught makeup artist has long dreamed of having his owncosmetics empire. A native of Sydney, Australia, now based in Los Angeles, Perdis has alwayssought to be a makeup artist for the people, helping them bring out their inner celebrity andtransform runway and red carpet trends to reality. The Napoleon Perdis philosophy is notdictated by fashion: its about accenting your natural beauty with confidence-building products.In 2008, Napoleon Perdis continues to take the beauty industry by storm. In addition toexpanding his cosmetics empire on a global level, the leading artist launched a new lineexclusively for Target, NP SET. In addition to managing Napoleon Perdis as well as NP SET,Napoleon is still an in-demand makeup artist. Since its unveiling in the U.S., the brand hasquickly gained an impressive celebrity admirers that includes Evangeline Lilly, Winona Ryder,Debra Messing, Jessica Lowndes, Shenae Grimes, Catt Sadler, LeAnn Rimes, Melissa George,Kelly Hu, Nicollette Sheridan, Rose McGowan, Amanda Bynes and Hilary and Hayley Duff,among others.